The construction industry includes from concrete prefab to formwork and metal structures, concrete skips and prefabricated modules, pallet forks to rental equipment, and tower cranes to WC modules, amongst many other applications. Tower cranes are mainly used to raise and distribute loads by using a hook suspended from a cable, which can be moved in a radius of several meters, and at different levels and directions. Thanks to its ability to lift the load high and to the fact that it can be installed on a temporary basis, tower cranes are essential in the construction industry. 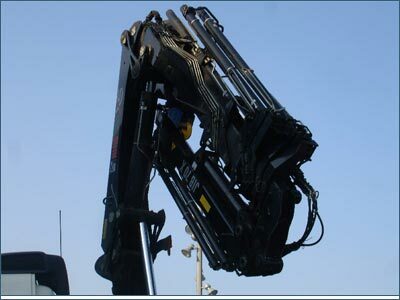 This type of crane can be mounted on fixed or mobile bases. In the first case the crane cannot move, and is often embedded in the floor or immobilized in some way. 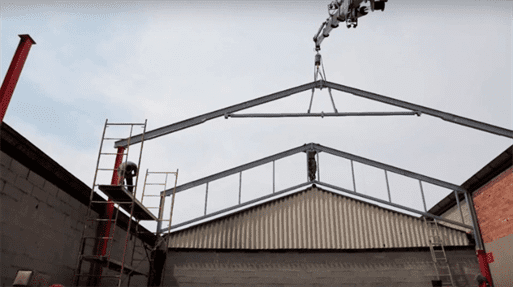 Mobile cranes have their base arranged on rails, allowing its horizontal displacement, or the can be installed as so-called climbing, which allows vertical scrolling up and down to grow as does the build. Tower cranes can be horizontal or luffing jib (allows moving from the horizontal position to a substantially vertical one), Regarding on its mode of installation, they can be classified into self-pillars, deployable and self-mounting crane. 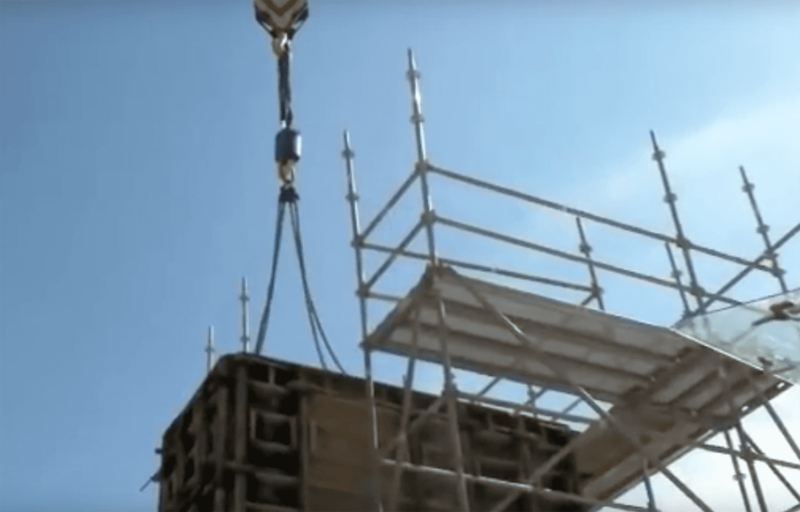 Handling and control of the tower crane must be performed by skilled operators as the risks associated with the different operations carried out are high. Especially dangerous are the actions related to the engagement and disengagement of the load. These operations not only require a precise crane control, but also a well-coordinated operator and signaller work, to avoid risks related to cargo handling. The coupling and uncoupling activities, aside of tight control, require a lot of operator time, resulting in a decrease in productivity. Intending to avoid risks and optimize both cargo handling and productivity, the elebia lifting hooks for cranes are leading a revolution in those sectors where the use of the tower crane is essential. These crane hooks allow the remote engagement and disengagement of the load without requiring its direct handling. This means that work can be done in a more safely and comfortably way, also with fewer staff. Moreover, this is a highly reliable system that prevents that the load can be released once it has been engaged. In an innovative and constantly changing environment, automatic crane hooks manufactured by elebia, an industry-leading automation company, are evidencing to be the best choice to improve and optimize tower cranes, not only because they are compatible with any type of tower crane, independently of the manufacturer, but for its simple and fast installation. ..."There is a definite reduced operation time of the crane..."
..."The crane often had to wait until an operator travelled to the load to release the hook. Now the crane does not stand still, and there's no downtime..."
..."Murphy’s Law is true. 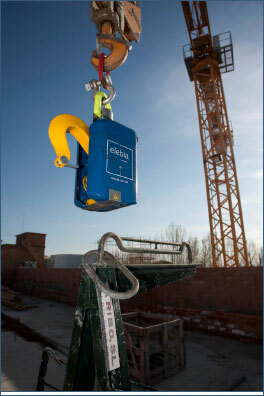 You are at the top of the bulding and the concrete skip or the pallet fork is at the bottom… With elebia, this is no longer a problem…"
Thanks to elebia automatic hook, you can hook and release the concrete skips automatically, without releasing the controls of the crane, thus avoiding any manipulation and displacement. Depending on the model and size of crane, it is advisable to do some work for installation, so that the automatic hook is properly stored and does not exceed the gauge. It is a simple customisation. Formwork operations will be much safer and more efficient by handling materials remotely and safely. By using the elebia automatic hook, many lifting and assembly of steel structures operations are optimised, obtaining reductions in operating time, personal savings and machinery, such as baskets trucks. In the video shown below, you can see a remote release of a structure. Thus, it is possible to assemble structures without having an operator manually release the hook. With the use of the elebia automatic hook, you can hook and release the fork without manipulation. There is no need to get on and off the truck bed. The whole operation is performed from the crane controls. Thanks to elebia automatic hook, you can hook and release the concrete prefab automatically, without releasing the controls of the crane, thus avoiding any manipulation and displacement. Avoid injuries or chronic illness as it is not necessary to repeatedly climb up and down the truck bed. The elebia automatic hook is failsafe. It is not possible to drop the load while suspended. The image your company transmits to customers is clearly improved by using the most innovative and technichal means available. Minimum and very simple maintenance. You could not always place the silo where the customer needed, as there were often inaccessible areas for the truck. This problem has become even more prevalent in urban areas with limited space. 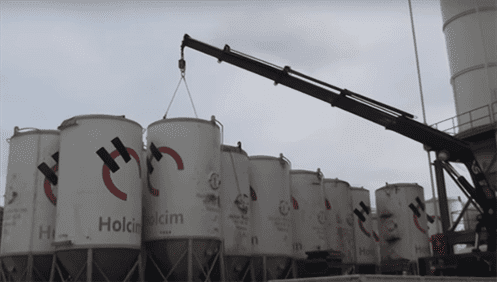 The silo-truck only serves only for this purpose, compared to the versatility of a truck crane. Despite these setbacks, this was the most efficient and secure process. But thanks to the elebia automatic hook elebia this has changed. 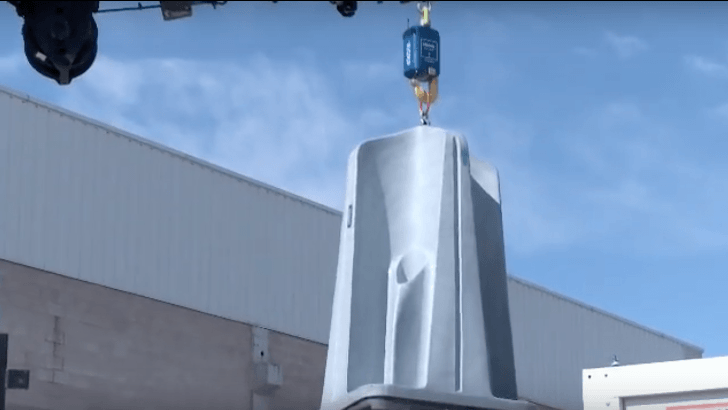 The elebia system allows crane mounted trucks through the entire process of loading, unloading and lifting of the silo safely solving these limitations. 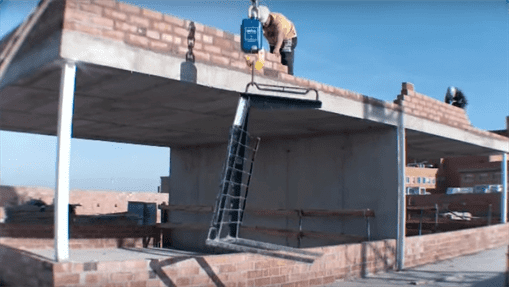 It allows to place the silo in areas without access to the silo-truck. The crane truck is much more versatile. The elebia remote hook increases the safety of crane loading operations by preventing the operator having to manipulate the hook and load. There is also the possibility of installing the remote control inside the crane, increasing comfort and efficiency. Thanks to the elebia automatic hook, loading and unloading and positioning of WC modules is done quickly and efficiently through the crane truck without a forklift. 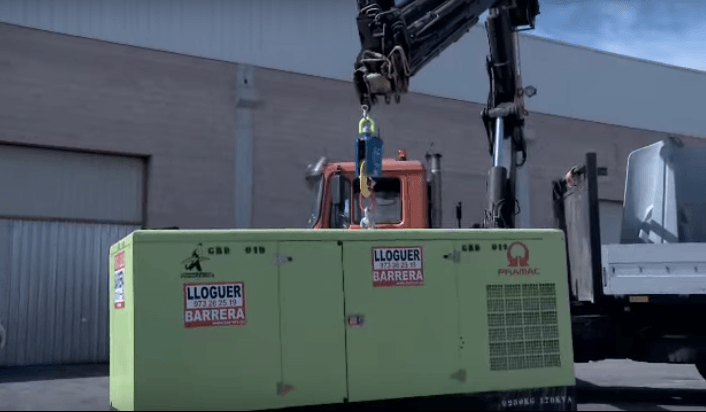 By incorporating a lifting ring or a simple wire rope sling, the operator can perform the automatic loading and unloading process, thereby increasing productivity and security of the process without climbing on to the truck bed. Everything can be handled from the controls of the crane.